The basement or a crawlspace is a common problem when you you hit with a heavy rain. From sudden summer storms, or spring rains and thawing snow, you need a plumbing contractor that have enough experience dealing with the challenges of your home basement, crawlspace and weather to ensure your basement and it's contents are protected from water damage. The sump pumps are used to remove water that has accumulated or collected in a sump pit. A sump pit, commonly found in the home basement or in crawlspaces is simply a depression designed to collect water some of them are designed like a tray that collects the rain water from the crawlspace. The water may enter through the perimeter drains of a basement waterproofing system directing the water into the pit. Sump pumps can also handle excess rain or a naturally high ground water table, if the basement is below the water table level. Mr. Rescue Plumbing and Drain Cleaning service, maintain and install sump pumps and sump pump systems. What people are saying about Mr. 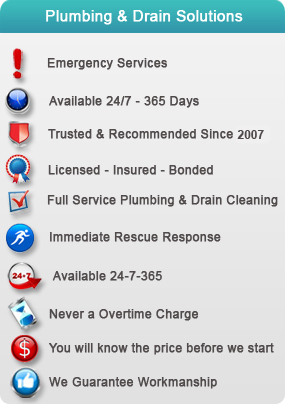 Rescue Plumbing and Drain Cleaning of Sunnyvale? How Sump Pump Work? A sump pump is installed in a sump pit (a plastic pit with holes drilled in the bottom) about 2 feet (60 centimeters) deep and 18 inches (45 centimeters) wide in the basement floor or in the crawl space that would fill up with water as the ground becomes saturated. 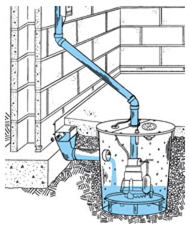 When the water in the hole gets high enough the sump pump powers on automatically and pushes the water up a discharge pipe that leads out to the downspout or a lawn. The pipe usually has a one-way valve called a check valve at the pump end to keep the water from flowing back into the pit. The building codes usually require a drain tile (usually 3 " to 4" corrugated plastic pipe - or a clay pipe in older homes) to run around the perimeter of the house's foundation under the concrete basement floor and to be tied into a sump pit when a house is built. The drain tile has slits on its walls so that as the ground water rises up under the basement floor or crawl space, the water seeps into the tile and runs downhill into the pit to be pumped out. When the drain tile is installed, it is buried in the gravel bed to make it easy the flow of water seeping in to the slits, and with fabric covering over the tile to prevent silt from entering and clogging the pipes. Sump pumps are usually equipped with a 1/4 or 1/3 HP motor and come with either a plastic or a cast iron housing. • Reduces the potential of damage to foundations and ensures structural integrity of foundation. • Prevents fungus, molds and mildew concerns, resulting in a cleaner and healthier home. • Prevents rust and corrosion of metal appliances, furnishings, and structures. • Prevents the basements and crawlspaces from flooding. • Keeps the crawlspaces dry in heavy rains. • In case of power outage the battery back up system keeps the pumps working. 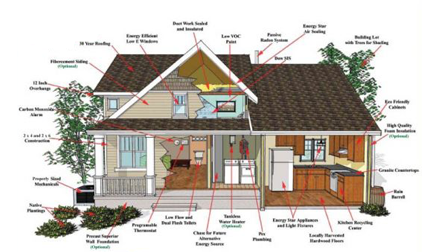 • It reduces the strain on your house or property structure. • It is insurance against the loss of your valuable possessions. • Restores the proper value of your property. • Keeps the dampness from settling, making the basement warmer. • Results in a clear and a healthier home. • Prevents termite and insect infection. • Prevents wall coverings, furniture and paint from peeling. • Maximizes the property value. Types of Sump Pump The sump pump is the engine or the heart of the drain system. Water moves into the drain lines and is routed to the sump basin where the sump pump kicks in and pumps the water out of the crawl space or a basement via a discharge or a drain line. In reality the sump pump is the key to the consistent discharge of the ground water from crawl space or the basement keeping it free of standing water and maintaining the ground level. Mr. Rescue Plumbing and Drain Cleaning is expert in installing any kind of sump pump at your home or office. 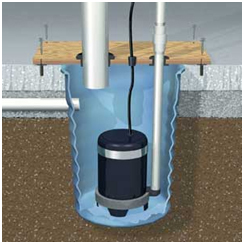 Pedestal Sump Pump Pedestal Sump Pump is a type of pump that sits above the water line in a basement. It is designed to pump the excess water out of the pit. The way that it works is that there is a sensor on the sump pump that measures the water level. When it reaches a certain point, the pedestal sump pump automatically powers turns on and pumps the water out. These pumps also come with a alarm system which alerts when the sump pump stops working. Submersible Sump Pump The submersible sump pump is designed to function underwater. The submersible sump pump costs more than a pedestal sump pump, but it can last longer because the motors are sealed and protected. This type of pump is quieter, and there is no need to maintain it often. Apart from those advantages, this pump can handle a larger volume of water, and it is least hazardous for your family. The motor operates an impeller device that spurts water out in a ray-like pattern. The submersible pump consists of a sensor that tells when water is present in order to start the pumping. The sensor is positioned at the place where water runs beyond normal levels. A delay mechanism allows the pump to work in a manner that allows the pump to dispense water before pumping additional water through. This protects the functioning of the motor so it doesn't burn out. Battery Back - up Sump Pump Mr. Rescue Plumbing and Drain Cleaning uses relatively new technology, which offers the best flooding protection for your home. It combines the reliable performance of high quality sump pumps with a battery system that will keep you basement and crawl space dry even if the power goes out and it provides the ultimate in peace of mind protection. The battery backup sump pump systems are designed in a way that sump pump will continue to work when your electricity fails. The worst water damage occurs when there is no electricity mostly during heavy storms and rain. If you don't have the battery back up sump pump then the sump pump will not pump water out from your basement or crawlspace resulting in a heady flood and can result is structural damages. 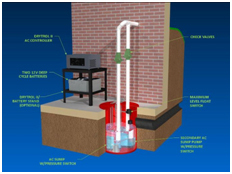 Battery backup sump pump systems are the perfect insurance against a flooded basement. Centrifugal Sump Pump The Centrifugal Sump Pumps are the most common type of sump pumps. A centrifugal sump pump uses a impeller. The common sump pump used is a centrifugal sump pump to pump water out. When the motor powers on, it causes a screw- or fanlike device called an impeller to turn. As name indicates the centrifugal pump uses a centrifugal force, the spinning impeller pushes the water toward the sides of the pipe, creating a low-pressure area at its center. Water from the pit rushes to fill the void, and the impeller's spinning action pushes it out through the pipe and finally discharged. Sump Pump Maintenance and Repair Mr. 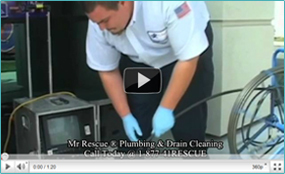 Rescue Plumbing and Drain Cleaning provides full sump pump maintenance and repair services. Whether we did your initial sump pump installation or not, we have the right skills to work on all makes and models of sump pumps. Do you need to learn more about sum pumps and how they can keep your house safe from flooding or you need any service done on a broken and non functioning sump just give us am call and our experts will be at you home in less than 45 minutes. The Sump Pump and sump tank should be inspected at least once every year in order to ensure that the system is operating at its peak level. For such a crucial part of your drain system you should rely on Mr. Rescue Plumbing and Drain Cleaning only. Sump Pump in standing water is very dangerous so don't take that risk call experts at Mr. 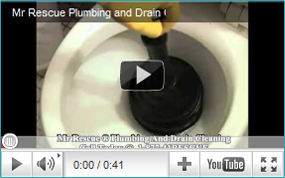 Rescue Plumbing and Drain Cleaning . Mr. Rescue Plumbers are always available 24 hours a day 7 days a week to help you design the right sump pump system for your house. 10% off any Sump Pump Installed - Repaired - Replaced It is necessary to have some type of sump pump in order to control the amount of water and ensure there is no flooding and damage to the basement or anything contained in it. Regular Maintenance of Your whole house Sump Pump System.